Heat shrink tubing Hair Rigs for Carp Fishing in 1.6mm I/D and 2.0mm I/D. High performance grade polyolefin heat shrink sleeving. Black heat shrink tubing Hair Rigs for Carp Fishing - sizes 2.0mm I/D & 1.6mm I/D. Designed for the production of neat anti-eject rigs this tubing is formulated so that it is stiff enough to take and retain any angle or bend set during shrinkage and helps to form a really neat presentation. 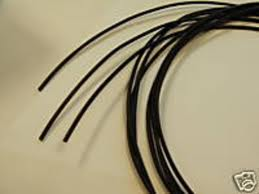 This tubing provides a consistant internal bore for easy line threading. The tube has a heavy wall for good sinkage and abrasion resistance whilst keeping its elasticity and maintaining its colour unlike any other rig tube. Used primarily as an anti tangle tube in conjunction with lead clips, inline leads, tail rubbers and helicopter rigs.